It’s been entirely too long since I sank my teeth into a thick, juicy bone-in pork chop. Much, much too long. I knew this was true when I saw a Double-Fennel Pork Chop recipe on the Fine Cooking web site that brought tears to my eyes; like seeing a photograph of a long lost friend. Fennel and orange-fantastic with pork. I followed the spirit of the recipe, but with citrus so sweet and abundant at this time of the year, I added sliced fresh oranges to the recipe — orange and fennel are so lovely together. I also reduced the butter by a couple of tablespoons, omitted the parsley, and don’t think the recipe suffered from their omission; it was delicious. You could make the recipe using boneless chops but the bone, to my palate, adds much flavor to the meat. Most pork chops you will find packaged in the grocery store are 3/4-inch thick. If you use those, you will need to reduce the cooking time. Crush fennel seeds in a mortar and pestle or with the back of a skillet. Transfer to a bowl and combine with 2 teaspoons kosher salt and 1 teaspoon freshly ground pepper. Season both sides of the pork chops with 3 teaspoons of this mixture. In a large, heavy-bottomed skillet, heat butter and olive oil over medium heat. 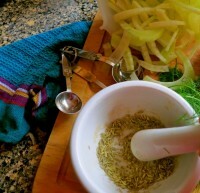 Place sliced fennel, chicken stock and remaining fennel seasoning in pan and cook until tender, about 10 minutes. Stir in oranges and chopped fennel; remove from pan and reserve. Wipe pan clean and heat oil over medium-high heat. Cook pork chops 6-7 minutes per side, adjusting heat as needed so chops sizzle but don’t burn. Chops are done when the meat is white close to the bone; don’t overcook. 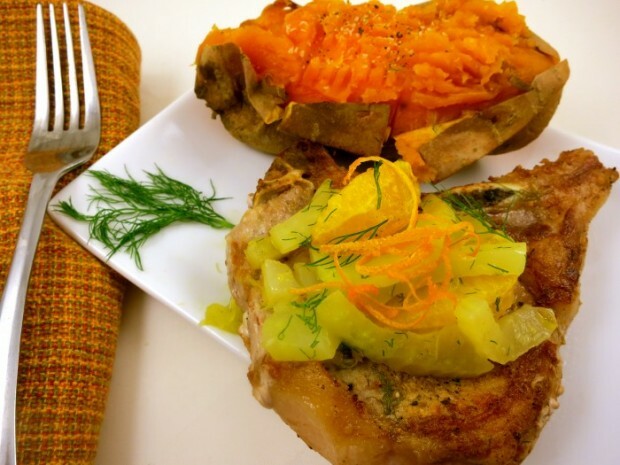 Remove chops and place fennel orange mixture in pan; quickly reheat then serve over chops, garnishing with orange zest, if desired.